The Browning A5 Sweet Sixteen has finally arrived. It is more honestly referred to as just the “Sweet Sixteen,” as the current A5 has nothing whatsoever to do with the Browning Auto-Five, absolutely nothing at all. The 2016 Sweet Sixteen is a lightweight inertia actioned autoloader: Browning's treatment of the Bruno Civolani floating bolt action that has long been popularized by the Benelli brand. It is an aluminum alloy receiver split bolt shotgun, renamed as the “Kinematic Action” by Browning marketing. It is an extremely lightweight shotgun, lighter than most 20 gauge autos. Browning Silver 20 gauges run about 6-1/2 lbs., my Browning B-80 and Beretta 303 20 gauges are at 6-1/4 lbs., the Weatherby SA-08 hits 6 lbs. on the nose, and my Benelli M2 24 inch weighs precisely 6 lbs as well. This Browning Sweet Sixteen weighs 5 lbs., 14 oz. with a 28 inch barrel. This Sweet Sixteen, like most all Browning repeaters, is sorely in need of a trigger job, for the trigger break weight exceeds the weight of the gun. Unloaded, with the safety off, you can balance the entire gun on your forefinger and no click is forthcoming. It breaks at an excessively heavy 6 lbs. Although Browning clearly states “brass bead front sight” for the new Sweet Sixteen, that isn't what is supplied. It has a red tubular front bead, along with a worthless attempt at a white center bead. In the Browning specs, they do list “fiber optic” however. The problem with the worthless white center bead is that it is far worse than worthless: it completely obscures the front red tubular bead. You could throw the red bead away and in shooting the gun, you'd never know it was missing. It is ridiculous, so it looks like a center bead extraction (just like the new 12 gauge A5s) is in order. Not only is it “in order,” I've already done it. The obnoxious center bead is not threaded, just pressed into a smooth hole. I'm left with an unsightly hole, but at least the gun is now usable. Drop at Heel 2 1/4"
Also supplied with the gun are two skeletonized plastic spacers to slightly increase the buttstock length if you prefer. There are no shims for drop or cast, no shims period supplied with the gun. However, according to the owners manual, shims are available, The Sweet Sixteen has a neutral cast stock (with what Browning calls a neutral cast shim installed) and fits me well as supplied. While most Browning product has no warranty, the new A5 series does carry a five-year, 100,000 round guarantee. Where Browning does deserve great credit is the 16 gauge DS barrel profile. It is, at long last, a very light and responsive true 16 gauge barrel: not a 12 gauge with a smaller hole in it. The entire 28 inch barrel weighs only 1 lb., 12.5 oz. with the Modified DS choke installed. As a result, the Sweet Sixteen is superbly balanced with a 28 inch barrel, slightly muzzle light unloaded which is ideal. The Sweet Sixteen's bore measures .669 in. The IC choke has a .006 inch constriction, the Modified Choke has a .011 in. constriction, and the Full choke (lead-only) measures .621 exit diameter yielding a whopper-doodle .048 inch constriction. 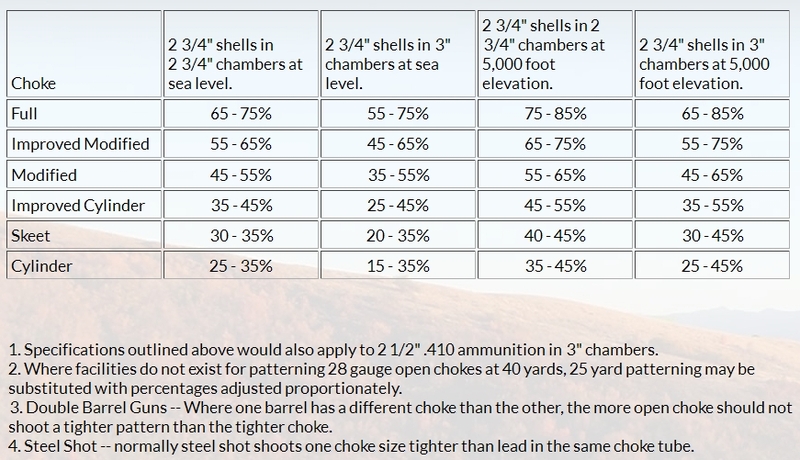 So, yes, it appears that Browning has screwed the pooch on DS chokes yet again. Browning sheepishly that “longer choke tapers are optimized to percentages, not percentage only.” Unfortunately, Browning is unable to define their “optimization” and several factory chokes (Fabarm Exis) actually have longer tapers than Invector-DS tubes. Browning publishes what they feel pattern percentages are supposed to be, above. It is another hot mess, but only the patterning board can show how bad it is. You would have to buy into the inane notion that a mysterious slightly longer taper needs only .011 in. to net “Modified Performance,” but works so very, very badly that it takes a Turkey Choke area constriction, .048 inch, to net “Full Performance” which only requires .030 in. from George Trulock and .035 inch constriction, in all gauges, from Kreighoff. This is really peculiar, so strange that you just can't make this up. Anyway, George Trulock is the type of fellow that likes a challenge, so perhaps he can come up with a .020 - .025 in. constriction 16 gauge Invector-DS compatible choke tube that I can actually hunt with.